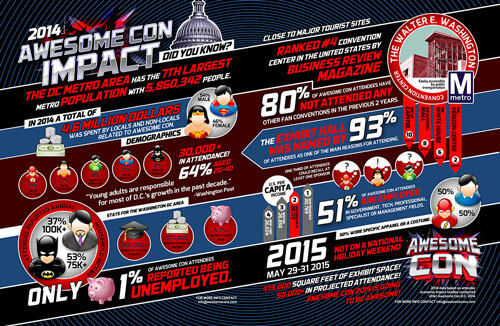 Awesome Con is in Washington, D.C. this weekend and I can’t wait to see the Metro flooded with cyborgs, otaku and every version of fan and cosplay imaginable. Founded in 2013, Awesome Con deserves special commendation for their Zero Tolerance Policy on gender-based harassment. Their website states very clearly that cosplay does not mean consent, even stipulating that guests must ask permission before they take a photograph of any individuals in cosplay. Throughout the weekend, I will be conducting interviews with Awesome Con staff, including co-founder Ben Penrod, as well as Collective Action For Safe Spaces and Feminist Public Works to learn more about their anti-harassment training and how the training will be implemented for guests and participants. There are so many panels taking place Friday, Saturday and Sunday, but I want to spotlight the events I’ll be sure to attend. Not only will there be screenings of Cowboy BeBop, Sailor Moon, Deathnote, and forthcoming horror movies like Tales of Poe, as well as bouts of tabletop and video gaming, but many of the panels deal with representation and diversity in comics, body positivity and safety in geek spaces, and the role of culture, science and technology in alternative universe building. Body shaming, racism, negativity, bullying. The cosplay community faces these challenges on a daily basis. How do these topics impact the community? What we can to do help resolve them? A gamer should not be judged by her gender, but by the content of her character sheet! We’ll talk about women’s experiences in gaming, how to replicate the good, and how to reduce the bad. Let’s work to make gaming more diverse, welcoming, and fun! Since Captain Kirk first glimpsed an immodest miniskirt, sexuality has been as much a Star Trek element as warp drive.. Sexual themes are all throughout Star Trek, and there are many characters and episodes that inspire tasteful discussion. Shall we? We’ve now discovered over 1,000 exoplanets orbiting other stars, but can we ever reach them? This panel will explore the differences between science fiction’s portrayal of interstellar travel with the reality of such a journey. Join Howard County’s Sexual & Domestic Violence Center as they discuss depictions of gender, sexuality, and culture within the geek community, and how these important themes connect to gender based violence amongst and within that community. Women in genre were the damsels in distress. Now, they’re “strong female characters,” who look great in leather. We’ll discuss problems with this cliche, since the real evolution for women characters should be as dynamic agents of their own stories. Language shapes society and civilization, and gives depth and realism to other cultures in science fiction. Learn how the languages of Star Trek were developed and explore the future of modern languages in the coming centuries with other experts. Comics have long reflected very little of the diversity we see in daily life both on the page and behind the scenes. Come hear and talk to several of the people working to reflect that diversity on both sides of the industry. An exploration of the zombie as a modern pop culture icon, from its first cinematic appearance in 1932 to the present. Why are we drawn to these dark carnival mirror reflections of us, and what do zombies have to say about our society and what we most fear? With the help of some of the most successful examples of the zombie in media through the decades, Dr. Blumberg opens the door to the crypt and invites us to have a look inside. Comic books are undergoing a renaissance led by some of the most interesting, badass, quirky, and above all independent female characters comics has ever seen. Come talk to writers and artists about what makes great female characters. This session offers a fun look at the psychological significance of four sci-fi TV series (TNG, Voyager, B5, and BG), which weave together Christian and Gnostic symbolism and “dream the myth onwards” in Carl Jung’s words. Join the Fake Geek Girls podcast in a discussion about women’s role in Nerd Culture and how women are certainly not “Fake Geek Girls”. Share stories, experiences and how much we love being nerd girls! The convention will be held at Walter E. Washington Convention Center, right by the Mt. Vernon Metro stop. Conveniently close to the city center, and within walking distance to other cultural monuments like the White House and the National Mall, there are plenty of places for geeky gatherings. If you need a pick-me up, I would recommend Compass Coffee–they roast their beans in house and emphasis fair trade. Busboys and Poets on 5th and K has an awesome selection of vegetarian and gluten free options, a bookstore emphasizing social justice fiction and non-fiction, and music or artistic performances on a regular basis. Sundevich has a banging selection of sandwiches from all over the world or you can always pack a picnic for Jazz Night in the Sculpture Garden on Friday. My goal: to get a beer and a slice of pizza with John Rhys-Davies. Just don’t tell the elf. Feel free to tweet at me (@JuJuJiving) if you’d like to meet up, chat, or say hello, especially if you’re in cosplay. This sounds so rad…wish I could experience it! And major kudos to the organizers for doing so much to create a safe, inclusive space for all attendees.